Listening to the stories of those who revert to Islam is always something that has been close to my heart. Such stories refresh Iman and faith in Allah SWT. In Saudi Arabia, there are many people, academies and institutions which help people to revert to Islam. Iman, who is a professional dentist revealed that her journey towards Islam was full of obstacles that were both social and religious. Yet she was motivated to come out of the darkness and it was only the light of Islam which helped her to do so. The light of Islam has let her come out of the inner darkness. Batool claimed that she was a true Christian before accepting Islam so much so that she had taken part in building a Church. However, something was still missing, and it was her inner peace. Her life was incomplete and that is what pinched her the most. This was the reason that she started to wander and finally, Islam came to her rescue. She is now a proud Muslim who practices Islam to her fullest. Ayesha told that what makes her heart get attached toward Islam is “recitation of the Holy Quran”. This is one of the most beautiful experience for her. For whenever she opens up the Quran and recites her she undergoes a magical feeling. In her own words, she describes that her heartbeat started to increase when she recited Surah Fatiha for the first time. Ayesha describes her life in two phases: A life before Islam and a life after Islam. The life before Islam was the one in which she had no satisfaction and she was confused, while the life after Islam is the one which she is satisfied and knows that all her worries are transitional that will disappear with time. 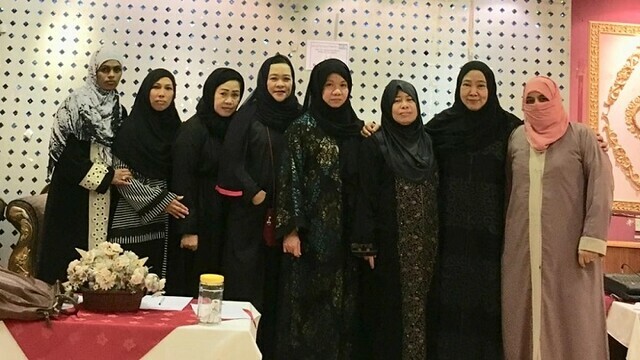 Alina who converted from Catholic to Islam in 2001, was able to get enlightened by Islam because of her colleagues who would guide her about Islam and their gifted English translated Quran helped her get to the right path. She said that recognizing “Allah” is the best thing that has ever happened to her. She wished she hadn’t delayed her acceptance towards Islam. Linda Joy, now Fatima Joy shared her long story. She said that converting to Islam was not like heading towards the bed of roses, rather she faced a lot of difficulties in it. It was due to the help of Allah Almighty that she was able to remain firm on her path and faced all her problems with bravery. There were instances where she could have diverted for the worldly peace yet Allah helped her all the way. Her journey towards Islam is a true inspiration that would help the Muslims to get aware of their true responsibilities. We, born Muslims, have taken a lot of things for granted and shall take lessons from Fatima. Fatima was only 4 when she came to Saudi Arabia. She, however, did not have a good experience with her fellow Muslim schoolmates in school and thereby she developed bitterness for Muslims and Islam in general. Umm Hudhaifah, formerly Scarlett Jane Condon, was also born to a Christian family but opted for Atheism. She was not satisfied and thereby started to search upon religions. She did not find Hinduism and Buddhism interesting. She later found about Islam and was delighted with its teachings. Islam was the most logical religion she had ever studied about in her life. She has been traveling to different parts of the world which have helped her to know about Muslims and Islam in –depth. Her experience in Yemen was most amazing and this was when she converted to Islam. For three years she has been living in Saudi Arabia. She says that when she looks back at her family they are equipped with all the luxuries except the luxury of Islam.